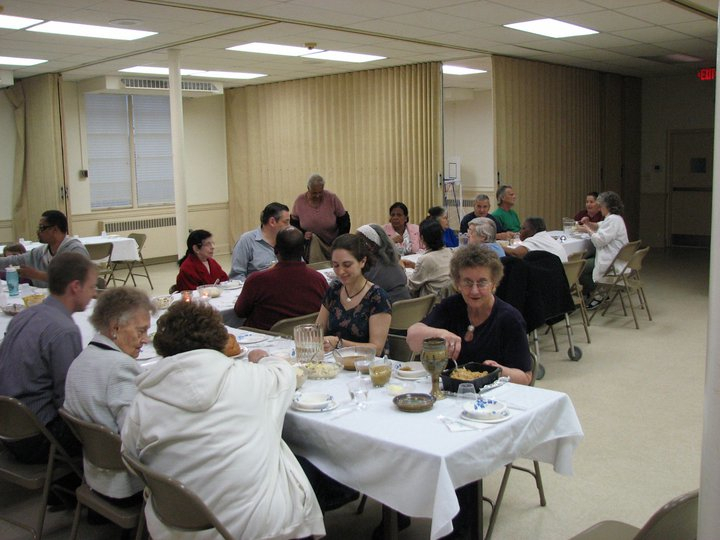 On Maundy Thursday, I gathered with members of my church around a cross-shaped table to share a simple meal, share our thoughts about the wonders and the worries of this world, and remember that Christ gave His life for all of it–and all of us. We served Communion to one another, read aloud from John chapter 13 and listened to Christ instruct us to go into this beautiful, crazy world and love it as He loves it, for that is how the world will know we are His disciples: by our love. It was a memorable Lenten experience. On my way home, I got to thinking about the sacred potential of just about any meal shared around any table as an act of community and a setting for dialogue. Then I thought about people with whom I would like to share a meal. Lots of folks came to mind (Bono, John McEnroe, President Obama, Rob Bell, Jon Stewart, my wife sans screaming toddlers, …); but if I could set a dinner date with anyone this Easter season to chat about faith and the world it would be Terry Jones. Not the Terry Jones who put the witch on trial in Monty Python and the Holy Grail (though I would like to have that conversation, too), but the Terry Jones who put the Qur’an on trial in Gainesville, Florida. 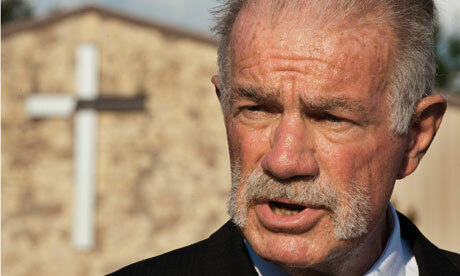 I’ve spent the last month trying to figure Pastor Jones out (and marveling at his Wyatt Earp mustache). Even after watching YouTube video of the March 20th proceedings, listening to interviews conducted by Anderson Cooper et al., and reading the journal of one the “jurors” from his congregation, I’m still dumbfounded by the entire affair. I just don’t get it. I would hope that away from the cameras and the microphones, pastor to pastor, Rev. Jones could help me understand his thinking. I tend to downplay the hellfire and brimstone stuff in Scripture. Perhaps he could help me see something new in those texts, or see something familiar from a different angle, so that I could grasp the terrible peril he sees in Islam. Or not. Perhaps he would tell me exactly what he told Anderson Cooper. Either way, I’d like to hear it straight from him. Then I’d ask him why he hasn’t yet charbroiled a Bible on his hibachi. I’d ask because I would assume that if his mission is to punish sacred texts that have inspired crimes against humanity and that continue to promote prejudice and intolerance, he would want to make fiery 1 examples of them all, not just the Qur’an. I would remind him that the Old Testament is not only rife with violence, it is rife with violence sanctioned by God. When the Israelites enter the Promised Land, for example, God instructs His people to kill the non-Israelite inhabitants of Canaan–including women, children, and livestock–whose only offense is that they aren’t counted among God’s “chosen people”. God even makes the sun stand still in one infamous passage so the slaughter doesn’t have to be called on account of darkness. I would also remind him that the “chosen people” in question are a band of former slaves whose pantheon of heroes is peopled with cheats (Jacob), whores (Tamar), adulterers (David), cowards (Adam), tyrants (Saul), murderers (David again), whiners (too many to count), and at least one incestuous drunk (Noah). I would point out to him that the New Testament is equally problematic, that in the Gospels Jesus says many disturbing things that threaten the foundation of freedom-loving societies everywhere, such as, “If your hand causes you to sin, cut it off. If your eye causes you to sin, pluck it out” (Mark 9.43, 47) and “Do not think that I have come to bring peace to the world; I have not come to bring peace, but a sword. For I have come to set a man against his father, and a daughter against her mother, and a daughter-in-law against her mother-in-law; and one’s foes will be members of one’s own household. Whoever loves father or mother more than me is not worthy of me; and whoever loves son or daughter more than me is not worthy of me; and whoever does not take up the cross and follow me is not worthy of me” (Matthew 10.34-38). Then I would remind him that over the centuries Christians have used Jesus’ claim in the Gospel of John that no one will get to heaven except by going through Him to sanction all kinds of mistreatment of non-Christians–including assault and murder–because, well, they’re going to Hell anyway. Other sections of the Bible have been used to justify slavery in the American South, apartheid in South Africa, and the oppression of women all over the world. Many Evangelical Christians enthusiastically supported the Iraq War in 2003 because they believed the American military would somehow blaze a trail for the Gospel through the Muslim world, even though it was sure to be a trail of death and destruction for many innocent civilians. Even today, people in the pews, in the pulpit, and in the halls of Congress are still using the Bible to deny global warming, cut social programs for the most vulnerable in our society, and discriminate against Americans of a certain orientation–among other things. So, if the Bible is more than those disturbing passages and Christianity is more than those flawed interpretations and corrupt justifications, can’t the same be true of the Qur’an and Islam? Assuming Pastor Jones didn’t walk out on me at this point, I think the ensuing conversation would be absolutely fascinating. And healthy. 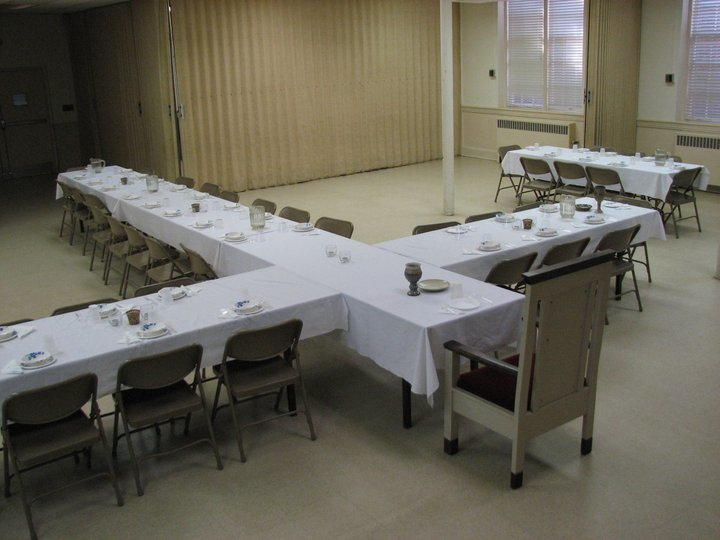 One of the things I reminded my congregation of on Maundy Thursday was that the folks Jesus gathered around that first Communion table were a motley crew from different walks of life with many different points of view on many different things. Some were fishermen. Others were tax collectors. A couple were zealots. At least one had betrayal in his heart. Yet Jesus gathered them all together. Whatever else divided them, He united them. And even though every single one of those fishers of men cut bait on Good Friday and left Jesus high and dry, He sent the faithful women who came to the tomb on Easter morning back for them. “Go and tell my brothers to go to Galilee; there they will see me” (Matthew 28.10). It’s all too easy and all too common for fellow Christians like Rev. Jones and myself to dismiss each other because we don’t see eye to eye on things, just as it’s easy to judge other people of other faiths because their beliefs and their holy books are different from our own. There is probably nothing Pastor Jones could say that would convince me his “trial” and subsequent burning of the Qur’an was either a Christian or patriotic act. There’s probably nothing I could say to convince him that his Qur’an “trial” was every bit as farcical as a Monty Python sketch but not nearly as funny. Nevertheless, both of us could still be in Christian communion together while conversing over the table in ways that we could never be while shouting at each other in the media. Whatever else divides us, Christ should unite us. The message of Lent is that all of us miss the mark, all of us fall short of the glory of God, and all of us have a limited and imperfect perspective on God, faith, and the world. Therefore we all need to repent and tend to the logs jutting out of our own eyes before worrying about the speck in our neighbor’s. We also need each other–no matter how different we are, no matter how divided we are on issues large and small–to help one another see the Gospel more fully. The message of Easter is that Christ is risen for the glory of God and the redemption of all the world–and all of us: those who deny and abandon Him as well as those who remain faithful through thick and thin. Which is why I am coming to believe that, while the road to Empty Tomb goes through the Cross, it truly begins at the table. That is where Lent and Easter truly meet and where we meet each other to find sustenance for the journey beyond both–into abundant life. 1 Jones allowed visitors to the Stand Up America Now website to vote a la American Idol and decide whether the Qur’an should be burned, drowned, shredded, or shot.